Rodrigues, 23, sounded happy recalling his warm memories of Mogilny. The second-year pro couldn’t stop smiling prior to his first NHL appearance in his hometown. “He’s always all smiles,” Sabres coach Dan Bylsma said. True, Rodrigues always seems to be grinning. But Saturday’s tilt, which was broadcast across Canada on “Hockey Night in Canada,” was extra special for Rodrigues, who, of course, grew up a Leafs fan. 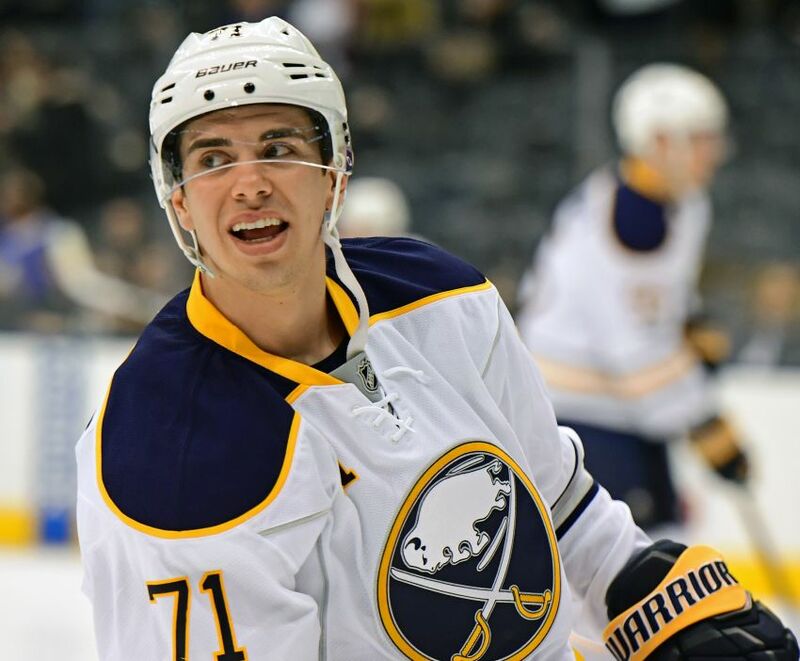 The Sabres wanted a speedy center, so they recalled Rodrigues from the Rochester Americans on Saturday morning. They summoned him on an emergency basis Thursday but he sat out a 5-2 loss to Anaheim because winger Evander Kane was healthy enough to play. Rodrigues played for the Amerks in Friday’s 3-2 loss to the Albany Devils, then took a car to Toronto. Bylsma joked Rodrigues should’ve worn No. 22 instead of 71 on Saturday because he was occupying Johan Larsson’s spot between Marcus Foligno and Brian Gionta. It could be an opportunity to stick around for Rodrigues, who played his fifth NHL game. With Larsson out for the season with a dislocated elbow and wrist, the Sabres have struggled to find another center. The 5-foot-10, 183-pound Rodrigues, a free agent from Boston University, has nine goals and 27 points in 44 AHL games this season. To make room room for Rodrigues, the Sabres scratched winger Nick Deslauriers for the sixth time in 13 games. Bylsma said Deslauriers is “probably a little bit worse for wear” after Thursday’s marathon fight with heavyweight Jared Boll. A bone bruise will sideline Sabres defenseman Cody Franson two to three weeks, Bylsma said. Franson blocked a shot Thursday and had a walking boot on his left foot Friday. Taylor Fedun replaced Franson against the Leafs and skated beside Justin Falk, his partner in Rochester earlier this season. The injury could affect the Sabres’ plans for Franson, an unrestricted free agent following the season, before the March 2 trade deadline. Defenseman are always in demand down the stretch, and as an established veteran with four seasons of 29 or more points, Franson figured to fetch at least a draft pick. But if Franson, 29, hasn’t recovered by then, will there be any interest? Franson has three goals and 16 points in 53 games this season. Ilitch, widely considered one of the NHL’s premier owners, died Friday at age 87. Detroit won four Stanley Cups under Ilitch, the founder of the Little Caesars pizza chain. The Sabres won’t face goalie Ryan Miller tonight when the Vancouver Canucks visit KeyBank Center. Miller, Buffalo’s starting netminder for nine years, played in Saturday afternoon’s 4-3 loss in Boston. Notes: Sabres defenseman Rasmus Ristolainen fought James van Riemsdyk in the first period, the Finn’s second NHL scrap, according to hockeyfights.com. … The Sabres scratched defenseman Zach Bogosian and center Zemgus Girgensons, who both have mid-body injuries.